Welcome to the Canton Lincoln High School Alumni Site. 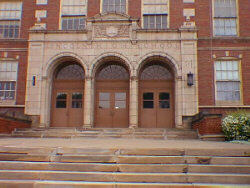 Lincoln was one of four public high schools serving the Canton City School District. The last class graduated in 1976 and the building was closed. Today the 85 year old building at 2107 Sixth St. S.W. is the home of the Heritage Christian School. The Alumni Association is keeping the Lincoln spirit alive through; interest in the Lincoln graduates, alumni activities and events, scholarships for alumni and their children, and contributions to community projects including the upkeep of the building. This site contains a registry of e-mail addresses for graduates, information about CLHSAA events,and a memorial page dedicated to classmates who are deceased. There is also a guest page to share your memories or current adventures with your Lincoln friends. We hope that you will visit often and join with others who have a special place in their heart for gold, maroon, lions, the 16th president and the neighborhoods and people that nurtured us in our formative years. CLHSAA membership is open to all who have graduated from or attended Lincoln High School. It is supported through your dues, fundraising events like the yearly Lincoln's Birthday Raffle and Dinner, and sale of Lincoln High souvenirs. We hope you will continue to keep the spirit of Lincoln alive through your support and volunteer efforts. Go Lions!